The Somnowell Chrome Mandibular Advancement Device (MAD) and Somnowell Clear MAD are contraindicated for patients who predominantly mouth breath during sleep (see: Am I a mouth breather?). Nasal breathing may be limited by obstruction in the nasal passage e.g. nasal aperture collapse, deviated septum, enlarged nasal polyps, enlarged tonsils adenoids or elongated soft palate and uvula. A referral to an ENT surgeon should be sought. Mandibular advancement devices work by posturing the jaw forward. They depend on nasal breathing. Sleeping posture is important. Sleeping on the side is recommended. Sleeping on the back may encourage the jaw and lips to fall open giving rise to mouth breathing. Removable devices may not be tolerated in patients with a marked gag reflex. A marked gag reflex may be resolved with hypnotherapy. Patients with very sensitive teeth and oral soft tissues may not be able to tolerate the wearing of removable oral devices. This condition may be improved by hypnotherapy and the gradual adaptation to the wearing of the device. The wearing of any removable device should be avoided if fits are uncontrolled e.g. epileptic fits. Somnowell mandibular advancement devices are not recommended for children. They should only be used once the permanent dentition is fully established usually 16 years and over. The wearing of a removable mouth device requires patient understanding and compliance. Patients with learning difficulties are often unable to wear these devices. Patients with an allergy to polymethylmethacrelate or other plastics should not wear the Somnowell Clear or a Somnowell Chrome with plastic elements. The Somnowell Chrome and other chrome Somnowell cast metal frameworks are free of nickel and molybdenum. No allergic responses have so far been reported in relation to the Somnowell Chrome cobalt metal frameworks. The piston rods are constructed of stainless steel. 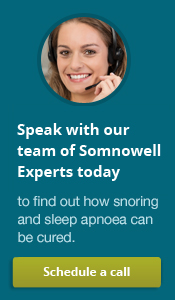 The Somnowell devices should only be worn by patients who have a dentally fit mouth. All dental work, fillings, crowns, extractions, root fillings, gum treatment should be treated before the Somnowell devices are made. The Somnowell device could worsen an uncontrolled dental condition. Am I a mouth breather? Identifying mouth breathing is challenging. Intermittent periods of mouth breathing is not unusual e.g.in the presence of a head cold or if the atmosphere is polluted or the nose is temporarily blocked. Habitual mouth breathing during sleep is problomatic. A frequent dry mouth and throat following sleep. Awareness by the patient that the lips and jaws are often apart. e.g. where the lips are full and not held together at rest, where the lips especially the upper are short in relation to the height of the upper jaw. Where keeping the lips together is difficult. Awareness that breathing through the nose is extremely difficult. Reported history of mouth breathing from the sleeping partner. The sleeping partner can verify this by placing a cool mirror near the nostrils and then the mouth. The presence of the mirror frosting over when placed near the mouth is a helpful sign of mouth breathing. Closing off each nostril in turn and seeing if nasal breathing is restricted is a simple means of assessment. If difficulty with nasal breathing is present, the help of an ENT surgeon should be sought. If the Somnowell fails to work, it fits comfortably when you are awake but falls out during sleep. This may be an indication that the jaw and lips are falling open during sleep causing the Somnowell to come away from the teeth and a further possible indication of mouth breathing. Can any Somnowell Mandibular Advancement Device be used if I mouth breath? No matter what MAD is supplied mouth breathing may continue to be a challenge. The addition of extra oral (outside of the mouth) jaw and lip restraining aids amy be required e.g. chin up strips, chin cap. This should be discussde with the Somnowell Partner dentist at the initial assessment. Will the teeth move or will the jaw relations change following the wearing of a mandibular advancement device ? Somnowell MAD’s as with all other MAD’s are derived from functional appliances used by orthodontists to alter tooth and jaw relations in children and young adults. In selected cases these devices are also used in the orthodontic treatment of adults to achieve tooth and or jaw relation changes. Any device worn in the mouth may cause an alteration in the dynamic balance of forces applied by the soft tissues and muscles of the face to the position of the teeth and jaw relations. The duration of wear and the magnitude of the force will affect the likely change. Fortunately with MAD’s used for sleep disorders, the risk of these unwanted changes, though always present, will be minimised providing the devices are properly fitted, worn strictly during sleep and perhaps not worn every night. In most patients the alteration in the dynamic balance of forces is temporary and the previous resting balance returns once the device is removed. The regular use of the jaw settler following the removal of the Somnowell MAD, supplied with the Somnowell, will encourage jaw resettling. The regular use of a bespoke thermo acrylic tooth settling wafer device constructed to the pre-treatment tooth position and jaw relation is also recommended. You will need to ask the dentist for this additional tooth settling wafer device. A pre existing positive overjet and positive overbite (the horizontal and vertical relation of the upper incisors to the lower) will provide a natural settling guide to the teeth and jaws following the wearing of the MAD. Excessive periods of MAD wear. A loose ill fitting, broken, unbalanced device. Failure to regularly use the tooth and jaw resettling measures prescribed with your device. Patients with a limited overjet, those with reduced or an incomplete overbite. The presence of a reverse overjet, described as a Class 111 incisor relation,(where the upper front teeth bite, or would meet behind the lower front teeth, often superimposed on a prognathic mandible and a small maxilla), are particularly at risk of adverse changes which are often permanent. The mandibular advancement device by its very nature, may aggrevate the pre-existing tooth mal alignement and jaw prognathism. If a patient has a pre existing backward jaw displacement, commonly seen in class 11 division 2 malocclusions, the introduction of a MAD which releases the trapped backwardly displaced mandible, may result in a change in the jaw relations. This change is often associated with a reduction in tempero mandibular jaw discomfort and associated symptoms but returning to the “normal” bite is difficult to achieve. The Somnowell Clear is an introductory alternative to the Somnowell Chrome. It is a low cost bespoke thermoplastic and acrylic dual cure device using a “Herbst” class 11 corrector piston rod jaw advancement mechanism. Its purpose is to enable the patient to experience the effectiveness of a mandibular advancement device. The Somnowell Clear suffers all the inherent shortcomings and limitations of plastic devices. The contraindications to the wearing of mandibular advancement devices apply to the Somnowell Clear. In addition the Somnowell Clear is contraindicated in the presence of jaw parafunction and or bruxism as the device is likely to break. The metal fixing parts, where these physically connect to the thermoplastic gum shields, often fail as a direct consequence of jaw parafunction and or bruxism. Such failures are not a defect in manufacture and are not covered by the Somnowell warrantee. Unfortunately the forces involved with jaw parafunction and bruxism are greater than that which the device materials can withstand. This list of contraindications is not exhaustive and are provided in good faith as a guide. Somnowell Ltd. cannot be held responsible for any omissions or errors.